A prominent Postal Sorting Machinery OEM was producing multiple variations of industry leading Postal Sorting equipment. Faced with fluctuating forecasts and other business conditions, the decision was made to outsource product to capable assembly vendors. Also, the vendor had to be able to handle multiple variations and models. Unfortunately, the current supply base of component manufacturers was not well suited to perform higher level assembly. 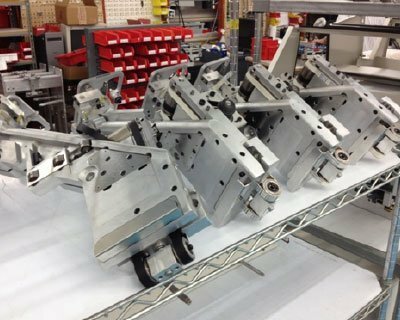 PEKO, formerly supplying parts at a component level to this customer, recommended their assembly division to integrate PEKO-made parts into higher assemblies. Customized work cells were created for the assembly operations, operators trained and tooling was produced. PEKO assigned a Program Manager due to the complex nature of these assemblies. The Program Manager put together a team of qualified manufacturing experts to ensure the program would be a success to ship based on customer demand and forecast. The team included Manufacturing Engineers, Production Planner, Assembly Supervisor, Quality Personnel and Purchasing. Bill of Materials was reviewed and finalized, component parts released to in-house manufacturing, off-the-shelf items procured, Quality documentation created and more. This assembly outsourcing exercise proved to be so successful, that the customer ultimately trusted PEKO to manufacture the entire product. The customer outsourced legacy product to PEKO, while keeping R&D and new product in-house. This allowed them to capture even more market share while still service product demand on older models of product.